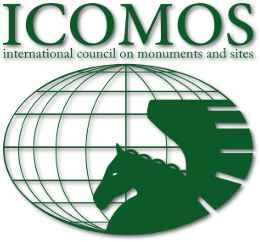 ICOMOS (International Council on Monuments and Sites) is an international non-governmental organization of experts including architects, historians, archaeologists, art historians, geographers, anthropologists, engineers and town planners. It is official adviser to UNESCO on cultural World Heritage Sites to improve the preservation of heritage, standards and techniques for each type of cultural heritage property created in 1965. Its principles are enshrined in the 1964 International Charter on the Conservation and Restoration of Monuments and Sites (the Venice Charter). ICOMOS is a member of the UNESCO panel of experts that spent several days visiting Stonehenge and privately meeting stakeholders including the Stonehenge Alliance in October 2015. Read our concerns here. The mission produced a report on its visit in May 2016. 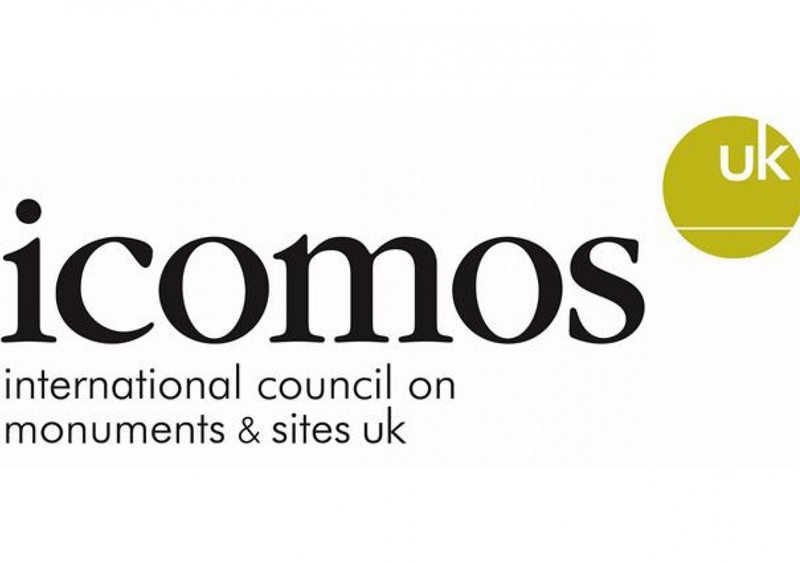 ICOMOS-UK is the UK committee of ICOMOS and advises on aspects of World Heritage and sites for nomination across the UK. It is an independent charity with a UK-wide and international mission to promote and support best practice in the conservation, care and understanding of the historic environment. 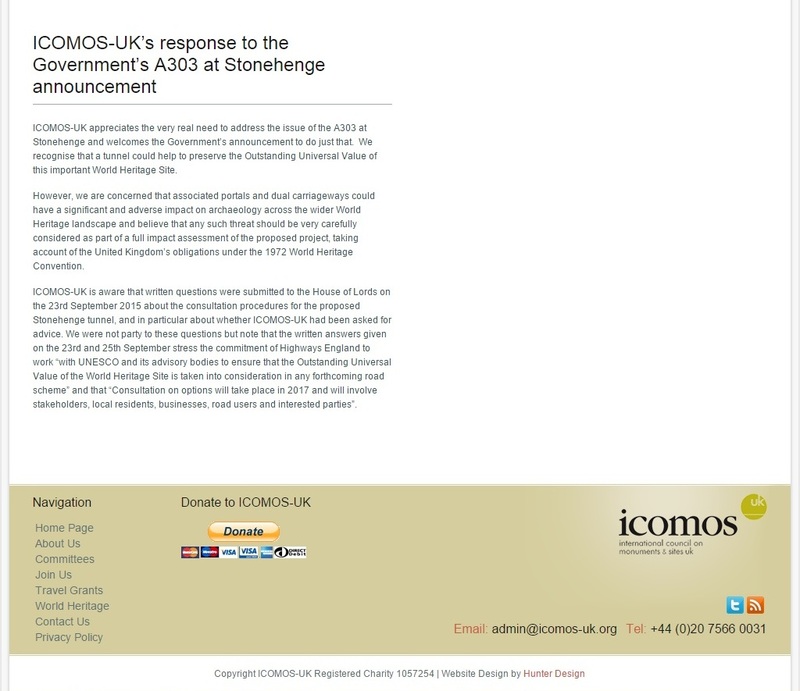 “ICOMOS-UK appreciates the very real need to address the issue of the A303 at Stonehenge and welcomes the Government’s announcement to do just that. We recognise that a tunnel could help to preserve the Outstanding Universal Value of this important World Heritage Site. A third paragraph was added in September 2015 following a series of Parliamentary Questions. 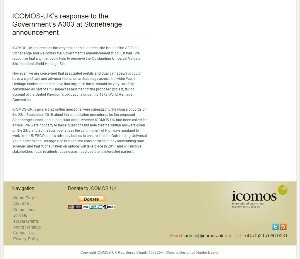 Statement in full on ICOMOS-UK home page. Please scroll down to the bottom. Please click on image to read statements in full on ICOMOS-UK. On 17th March 2006, leading independent conservation organisations agreed a common view of the current Highways Agency A303 Stonehenge Improvement Scheme Review consultation. These organisations together represented a large heritage and environmental constituency, and reflected local, national and international views, with a diverse range of professional and public opinions. Emerging from this meeting was a strong consensus on the issues underlying the A303 consultation, on a vision for the Stonehenge World Heritage site, on strategies for the way forward to achieve this vision, and on the potential for huge public value that an unencumbered World Heritage site could deliver.